Possibly the most enjoyable, relaxing round of golf you'll ever play! Watch for opening day 2019! This Just In! Our First Golf Tournament of 2019! Saturday, June 22 to Benefit The Ryan Home Project. Click on "Events"
Kids under 12 golf for free with a paying adult. *Ask Rene about additional discount for $3 off. Visit our About page to see some photos of the course taken at the end of August 2016. You can see the scorecard at right for yardages for each hole, from 102 - 297 yards. This course is good for walking, but we do have golf carts available for rent. Golf carts are available to rent, first come, first served, or you can reserve one in advance by calling Rene at 207-457-2380. 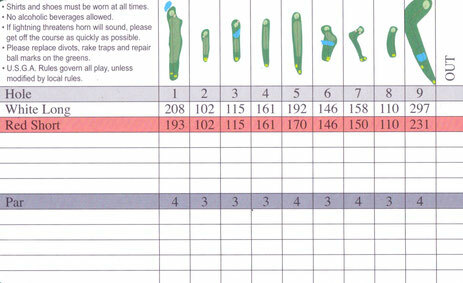 Scorecards are in the mailbox at The Hut. Feel free to head out if there is no one around to check you in. Rene will catch up with you out on the course. 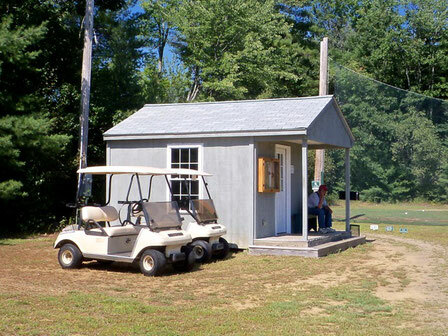 We usually have cold soda, water and light snacks available in The Hut along with pull carts and golf items including clubs for rent, balls, hats, etc. Ask us about holding your company golf outing, family golf outing, or fundraising event here. Enjoy over five months of unlimited golf with a 2018 membership for $600. Our opening day in the spring varies based on weather and condition of the greens. We are generally open the first weekend in May until the day before hunting season starts, which is usually around the end of October. Please click here to visit our Course Rules page to learn more about golfing at Lebanon Pines. 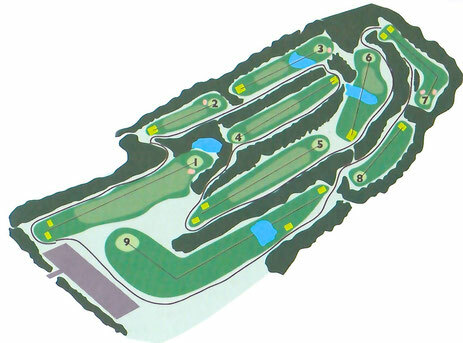 "Great 9 hole course! If you are looking for a fun and relaxing round of golf, this is definitely the place! I especially enjoy the fact that we can play on a well maintained course and are NEVER rushed along! Very friendly owners..."
"Rene does a great job keeping the course groomed and looking great." "First course I ever played. Perfect for learning your irons and forces you to hit the ball straight. Will always consider one of my favorites!"